Danaje Elliott knew he wanted to work in computer science or hardware engineering. He also knew he needed a job to save money for college. He never imagined, though, that he’d soon be standing on top of a roof in order to achieve both. 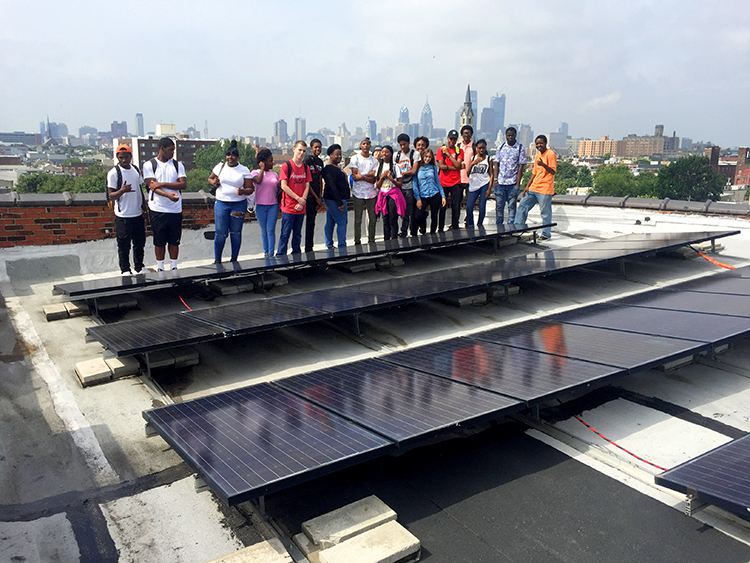 A few weeks after graduating high school, Elliott found himself several stories off the ground learning how to install his first solar panel through Find Your Power, a six-week WorkReady Philadelphia course launched this summer by the Philadelphia Energy Authority in partnership with the School District of Philadelphia’s Office of Career and Technical Education. Through the program, Elliott and 17 others received hands-on training in solar installation including technical skills such as mounting panels, securing legs and wiring modules. They also learned best practices around clean energy and general job readiness skills. Once thought to be reserved only for those who could afford it, the reputation of solar technology is changing. In fact, Philadelphia Energy Authority views it as a trio of opportunity for all: a clean energy option for the eco-conscious, a smart investment for those looking to save money on their energy bill, and a viable career path for people entering or re-entering the workforce. Find Your Power is a subset of PEA’s Solarize, the first citywide solar initiative that allows homeowners to install solar together at a reduced price. The concept of Solarize is simple: The more households that move forward with installation, the less the upfront cost for each household. For those who can’t access traditional financing, PEA and the Office of Sustainability are collaborating to create a lease option expected to launch in January 2018. Schapira says panels on an average row home could cover a household’s electricity consumption almost entirely. It typically takes about 10 years for a household to pay off the upfront cost and fully realize savings. Because solar installation is a labor-intensive process, more installations also mean more jobs. For every 100 participating households, 15 new living-wage jobs are created. With more than 120,000 eligible rooftops across Philadelphia, there is potential for a significant boost in workforce opportunities. This is an intentional result of PEA’s larger Philadelphia Energy Campaign, which plans to invest $1 billion in energy efficiency and clean energy as well as create 10,000 new jobs—supported by training and local, inclusive hiring—over the next 10 years. Improvements through the campaign will focus on four sectors: public schools, low- and moderate-income housing, small businesses and municipal buildings. Each area will pilot projects, like Find Your Power and Solarize, in various neighborhoods and then scale up and out to the rest of the city. PEA is leveraging best practices and additional support through collaboration with the city. The Energy Office, housed within the Office of Sustainability, leads municipal building projects within Philadelphia Energy Campaign; Adam Agalloco, the city’s energy manager, helps coordinate by serving on the PEA board of directors. The office also provides assistance in implementing long-term energy contracts. This close kinship signals a new synergy in clean energy action across Philadelphia, allowing for smoother and more rapid progress. “Everyone involved understands there is a real economic opportunity for the city that will not only save energy and support our climate change efforts but, beyond that, create real economic value in an equitable way,” says Schapira. According to the Office of Sustainability, Philadelphia’s regional electric grid mix is currently composed of 40 percent nuclear, 31 percent natural gas, 23 percent coal, 4 percent renewable (such as solar) and 2 percent miscellaneous fossil fuels. Buildings throughout the city (not just municipal) account for more than half of Philadelphia’s carbon emissions. The Philadelphia Museum of Art, for instance, is the city’s biggest electricity user. The Office of Sustainability knows there is work to be done and, in light of a political climate that includes the Trump administration withdrawing the country from the Paris Climate Accord, the office is prepared to forge ahead with or without federal support. One way the city is making good on this shift is by creating the Energy Master Plan. This roadmap will outline municipal government energy management and citywide energy policies that build toward the administration’s commitment to reduce carbon emissions 80 percent by 2050. In addition, this December the city will release the Citywide Energy Vision highlighting current and expected trends in our energy system as well as opportunities for residents and businesses to lead climate and energy goals. The Office of Sustainability says PEC will be an important tool for success in both cases, and PEA says they are ready. As PEA and the city work toward their goals, Jess Edelstein and her husband, Marc, are installing panels on their home this fall. Meanwhile, Danaje Elliott is keeping his fingers crossed for a job with Solar States, the local solar installation company that provided the hands-on training during his time with Find Your Power. After his first interview, he says he “has a good feeling” and is excited for what’s next.